You are here: Home ∼ 2017 ∼ February ∼ Roger Lean does it again. I’m lucky to own a LOMO LCA. The optics, the size, the cult status chic, the history but most importantly, the results are all things that I love. A few years ago my beloved LOMO LCA camera malfunctioned. 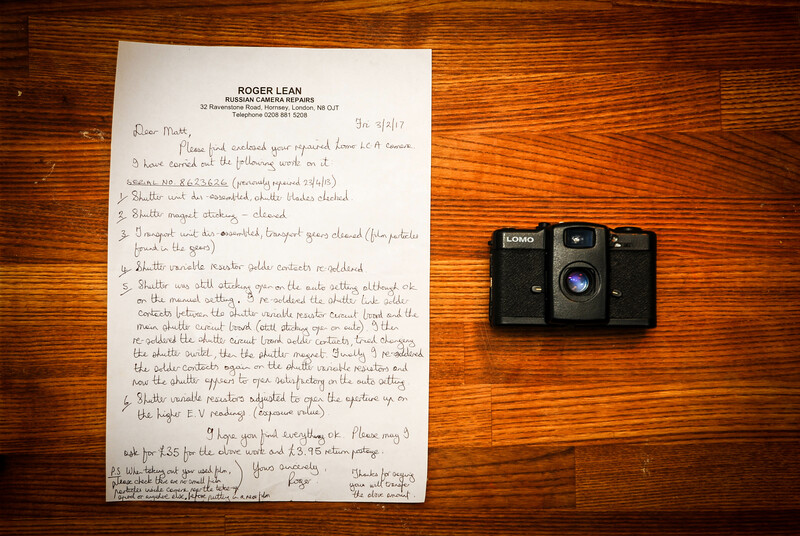 I’d heard about a chap called Roger Lean from the LOMO community so I sent it to him – here’s my blog about it. He did a superb job. So, who else should I turn to when it malfunctioned again? It had to be my main man Roger. He’s absolutely ON POINT for LOMO LCA repairs. Thanks for that, I spoke to him this morning and I’m going to send off the Lomo LC-A today and then I’ll be able to pick it up in person as he’s not too far away. I do remember Jonathan Smith, he was a very decent fellow (I’m sure he still is). I could do with him living round the back of our house, developing film is insanely expensive in these parts, I need to find a cheaper way of doing this. Still, had a great time today reacquainting myself with my knackered old Lomo.